CERET 공원 앞에 자리한 Blue Tree Towers Analia Franco Tatuape는 아날리아 프랑코(Anália Franco) 쇼핑몰에서 200m 거리에 있으며, 야외 수영장과 무료 Wi-Fi를 제공합니다. Analia Franco Blue Tree Towers의 모든 객실에는 냉난방 시설, 미니바, 케이블 TV가 완비되어 있습니다. 일부 객실은 공원의 탁 트인 전망, 발코니, 소형 주방을 갖추고 있습니다. 룸서비스는 24시간 이용 가능합니다. 구내의 Gastronomia Albuquerque 레스토랑은 이탈리아와 브라질 요리를 주축으로 세계 각국의 요리를 선보입니다. Blue Tree Towers Analia Franco Tatuape는 엑스포 센터 노르테(Expo Center Norte)에서 10km, 아레나 데 상파울루에서 14km 거리에 있습니다. 과룰류스 국제공항은 22km 거리에 있습니다. Blue Tree Towers Analia Franco Hotel is very nice Hotel for Transit or travel. It is very close to Big shopping mall and good location. it is located between 2 airports-Guarulhos and Congonhas, easy to go there. there is a park just opposite to the hotel. you can go walk every day. for shopping, there is a big shopping center near there, just 5 minutes by walking. Clean, good facilities, excellent breakfast and friendly staff. None, as long as it is near the place you need to go. I had a great experience with my wife. Went to a wedding nearby. Shopping centre and park just across the street. Breakfast was excellent, with a lot of options and fresh food. Rooms were clean, with mini-freezer, air-conditioning and cable tv. Staff very friendly. I was in São Paulo on business in Tatuapé, so the hotel was excellent for my purpose. The hotel is comfortable, the room is large (it has 2 twin beds, desk, chair and a couch, TV). The TV is not a new one but it has cable TV useful for adults and kids. The bathroom is alittle small but the water was great. The towels were kind of old. Breakfast was excellent with fresh fruits, cakes, juices, etc. 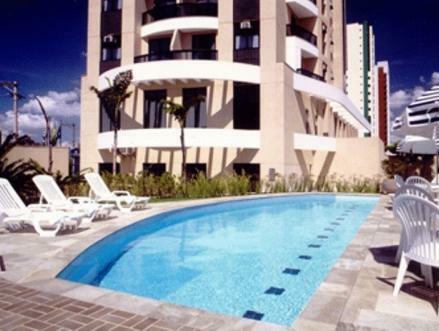 the hotel is a good option to stay while traveling to sao paulo. the breakfast is full of variety, the rooms are clean and have decent space. You can use internet in the rooms and also the tv range of channels is ok. The price is excellent cost bennefit. The only think you have to check is the distance between the hotel and the area you need to go in the city because of the distance and the traffic jams.